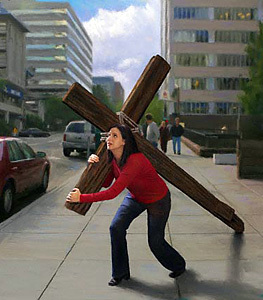 I just want to take the time to encourage you today to keep pressing and carrying your cross. Each one of us has our own unique one to bear. And one thing that's certain is that God will never put more on us than we can bear. Trust me, wherever you are at this point in your spiritual journey, God is in this with you. You are not alone. Yep, He knows exactly where you are. So whether life is good, crazy, awesome, or tough for you right now, the Lord wants you to know that He loves you and that He wants you to keep carrying your cross and stay faithful. If you’ve been a Christian for awhile, then you know that there are good days and bad days. There are days when you’re on cloud nine and days when you feel so discouraged that you don’t know which way is up. It’s just a part of the journey. I recall David saying, “Why am I discouraged? Why so sad? I will put my hope in God! I will praise him again-my Savior and my God!” (NLT) This Scripture is so encouraging to me, because it’s a moment when David’s spirit is so low and cast down, yet he realizes that he needs to shake that feeling off and praise God anyway! It reminds me of a recent time, when I was feeling kind of discouraged. I sensed the Lord telling me to talk to Him. He said, “Talk to me like I were a friend sitting across from you, and tell me everything that’s going on with you.” Now, God already knew what was going on inside of me, but He just wanted me to get it out so that He could put things into its proper perspective. So I did. I talked to Him and let Him know what I was feeling at the time and I sensed the Lord reminding me to stay faithful. It was all around me…in word, in song, and in prayer. After that, I immediately put on some praise and worship music and basked in His presence. It was awesome! Sometimes you have to do that. In the midst of the noise, busyness, fatigue, or discouragement, you have to stop and sit down and just talk to God. He’s available to listen at any time. Even when things are great, you still need to make time to just sit down and talk to Him. This is a part of being faithful. It’s about having a relationship and connecting with Him about everything. The Word of God is life! Breathe it in. Be encouraged my sister, and whatever you do…stay faithful until the end!